Everyone wants to look good, feel good, and have more energy. Yet we often overlook simple dietary changes that can provide our bodies with the nutrients they need to achieve the goals we want. 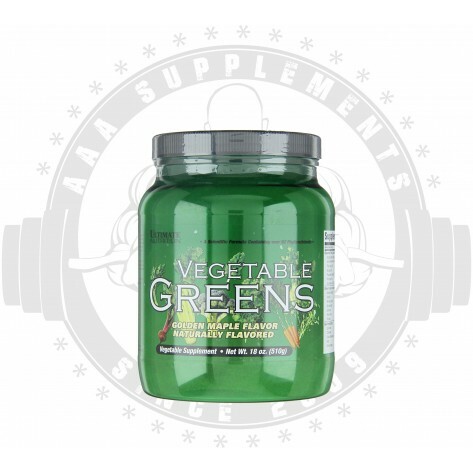 Ultimate Nutrition Vegetable Greens is a scientifically formulated combination of over 62 phytonutrients from herbal extracts, prebiotics, probiotics, plant enzymes, essential fatty acids (EFAs), super green foods, and land, sea and cruciferous vegetables. Vegetable Greens is dairy-free and is suitable for vegetarians. Vegetable Greens contains no artificial flavors, colors, or sweeteners, and has no hidden ingredients. Everyone wants to look good, feel good, and have more energy. Yet we often overlook simple dietary changes that can provide our bodies with the nutrients they need to achieve the goals we want. Even with the best of intentions, few of us eat the recommended five to eight servings of fruits and vegetables everyday. Also, the foods we eat have an impact on the delicate acid/alkaline balance of our bodies. Factors such as stress can increase the level of acidity within our bodies. By contrast, most fruits, land and sea vegetables, herbs and spices are alkalizing, which can help to keep our systems in balance. Your body needs essential fatty acids (EFAs) just as it needs other essential vitamins and minerals. Essential fatty acids play a role in everything from carbohydrate metabolism and proper immune function to brain and cardiovascular health and energy production. Studies have well established the health enhancing effect of green foods; boosting of levels of good bacteria (such as lactobacilli) and boosting of immunity. Green food concentrates such as barley greens, alfalfa, buckwheat, spinach, wheat grass and aloe vera help to balance the body's pH level, offsetting the acidity caused by many environmental factors. In addition to their nutritional value, green foods detoxify our bodies of unwanted metals and impurities. Ounce for ounce, sea vegetables are higher in vitamins and minerals than any other food group. Land vegetables supply vitamins, minerals and phytonutrients and have powerful antioxidant properties. Cruciferous vegetables such as broccoli, cauliflower, brussel sprouts, kale and watercress have glucosinolates, compounds that break down into indoles and isothiocyanates (ITCs). The standardized herbs in vegetable greens work collectively to maintain the immune system, act as powerful antioxidants and anti-inflammatories, and energize the body. Inulin, along with other dietary fiber, has been shown to promote regularity. Scientists have suggested that inulin and other fibers have potential health benefits that include maintaining colon health as a prebiotic, that increases the absorption of minerals, particularly calcium, and promotes immune function. Probiotics have been used for many years to increase the proportion of protective microflora. Fructooligosaccharides, a prebiotic fiber, ferments in the lower digestive tract and acts as a food source to the beneficial microflora that reside there. Prebiotics are critical to colon health and the immune system. Ultimate Nutrition Vegetable Greens is a scientifically formulated combination of over 62 phytonutrients from herbal extracts, prebiotics, probiotics, plant enzymes, essential fatty acids (EFAs), super green foods, and land, sea and cruciferous vegetables. Vegetable Greens is dairy-free and is suitable for vegetarians. Vegetable Greens contains no artificial flavors, colors, or sweeteners, and has no hidden ingredients. Other ingredients: Stevia Leaf, Organic Maple Syrup Powder. Contains Soy, Wheat and Tree Nut (ginko nut).